This Burmese noodle salad is called let thote sone which translate as hand-mixed assortment. It is served with all the individual ingredients laid out on the table and the fun of eating this salad is making it yourself; mashing the potatoes, feeling the wonderful textures of the noodles and adjusting the garnishes until there is a perfect balance of all the seasoning. I like mine with a generous squeeze of lime juice so it’s deliciously sharp and eat it Burmese style using my fingers. A couple of days beforehand, follow the instructions to make the Shan tofu. On the day, prepare the garnishes first. Make the crispy onions and oil, roasted chickpea powder, pound the dried shrimps into floss, chop the coriander and cut the limes. Add the hot water to the tamarind and leave for a few minutes to soften. Use a fork to mash the pulp and strain through a sieve to remove any stones or fibres. Next prepare the base ingredients. Cook the rice as you would normally then mix in the chilli & dried shrimp oil. Cook the different types of noodles, following their packet instructions. Boil the potatoes for 7-10 minutes until they are tender, drain and leave to cool. Finally shred the cabbage and slice the fried tofu and Shan tofu into ½cm slices. When all the ingredients are prepared, pile them individually on plates or in bowls and serve at room temperature. To make the perfect thote, take a small handful of each of the base ingredients. Add a teaspoon of crispy onions, chickpea powder, dried shrimps and coriander. Then a tablespoon of oil, a drizzle of tamarind liquid and a dash of fish sauce. Finally sprinkle chilli flakes and squeeze some lime juice, and mix well. It should be salty, sour and spicy. Thanks for the lovely recipes..just one small query..a lot of the dishes here call for roasted chickpea powder. Could you explain how to make that? You can buy chickpea powder from health food shops which have a slightly coarse texture. Just dry roast in a frying pan or wok, stirring until it is a shade darker. Taste a bit – it’s done when it does not taste bitter. 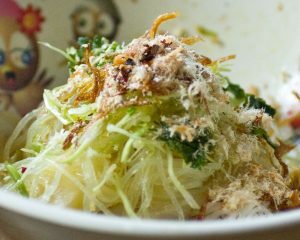 I have trying to find a recipe for Burmese Noodle Salad, it has flat noodles, slivered cucumbers, cubed potatoes, fried shallots and onion and a delicious chili type sauce. It’s amazing, I have been eating it for a year now at a Burmese restaurant in Burlingame and SF. The owner will not part with the recipe. Any ideas on the sauce? It sounds like the sauce/dressing is likely to be fried shallots oil, chili oil, tamarind, fish sauce and perhaps lime juice. Also some pea powder to make the noodles salad bind together. Does that sound about right? 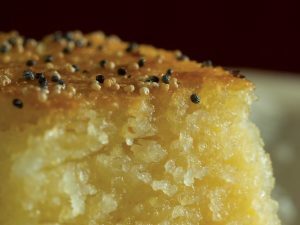 My Grandmother made a dish when I was a child called toothcakes. They look like the round glutenous balls you have in the book, but they were in a coconut mik and had jagery in the middle. Do you know what this is and do you have a recipe? Sounds very much like mon lone yae paw . Check it out and let me know if it is the toothcakes you’re looking for. The lat-toke is a perfect meal in the summer time; it can be eaten as a main meal or as a snack. We all love it. It is a really healthy food! how wonderful to see your recipes of Burmese food! Having been in England since childhood and relatives still in Burma, I had forgotten how wonderful the flavours are. I wanted to know if you have a recipe for Sum buok ( not the correct spelling I’m sure but that is the word sound I remember) It was a rice dish in a sort of gravy usually given to children? I can but hope you know of it! I got the recipe for spicy tamarind dressing from the owners of little yangon in Daly City, CA (this place is amazing). I too have been looking everywhere for it. It’s amazing on noodles or as a dip for just about anything. Never heard of little yangon, but i live about 5 minutes from Daly City so i will check it out to see if it is anything like the dish at Mingalaba in Burlingame and their sister restaurant in San Francisco called Mandalay. The actual name of the dish is “Kaw Soi Dok”, if that helps in identifying the ingredients in the sauce. They call it their secret sauce……..and won’t give out the recipe. Any ideas on the quanities for recipe provided by Evan?? Thank you for responding to my request, I have not given up yet! Hi, Can anyone please tell me what is the recipe for chilli & dried shrimp oil as It says that it is on page212 but i dont know , & can’t browse online. I shall email you shortly with the recipe for chilli & dried shrimp oil. Hi, I really appreciate & enjoy all your Burmese recipes. Can you please give me Khao sey recipe, the one with the chicken in coconut milk & served with noodles. Thanks. 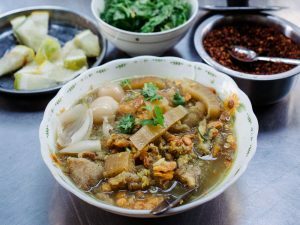 I would very much like the recipe for Chicken Khowsuey and how do I go about making a chilli oil and a dried srimp oil. Aso what other Burmese dish could I serve as an accompaniment to Khowsuey. Thanks so vm. 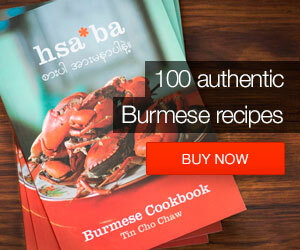 Great recipes…i love Burmese food. I left Burma 40 years ago and thanks to your website, taught myself a lot of dishes. Khowsuey thoke. I think that is the secret recipe in all the restaurants. I will be so thrilled to get this recipe. please i am dying to know that sp. oil (page 212) recipe too.. Cant wait to try that. I just love and love your site. Chickpea powder: Maybe I’m a bit late answering this one, but you can get chickpea powder in Indian supermarkets. It’s called gram flour. I’m writing from England, and it’s easy to get here: even larger Tesco branches have it. hi, I am an ESL teacher of many Burmese and Thai refugee students and they always eat the dried chili mixture on EVERYTHING! I’ve grown to LOVE it, but I can’t figure out what the 3rd ingredient is… it’s the crushed chili, salt, and ??? (some other white crystallized item). I enjoy your web site! Have you got a fb or fb page? I’d like to meet up and discuss a few things. I appreciate you for all your work. Hi, I had lived in northern Burma forty years ago. I remember a dish called “Tauk Tauk Kyaw” made of minced chicken or minced pork, in Chinese restaurants. I haven’t found this dish in any Chinese restaurants outside Burma. Can somebody give me its equivalent Chinese name so that I can order it in Chinese restaurants in Europe, Thailand, Malaysia, Australia, places where I visit frequently on business trips. If its recipe can be shared, I will be very grateful. Thanks in advance.